There are so many kinds and shades of denim, why not combine them all? This denim-block dress is already pretty amazing on its own, but I wanted to a create a look that's more fun and interesting. 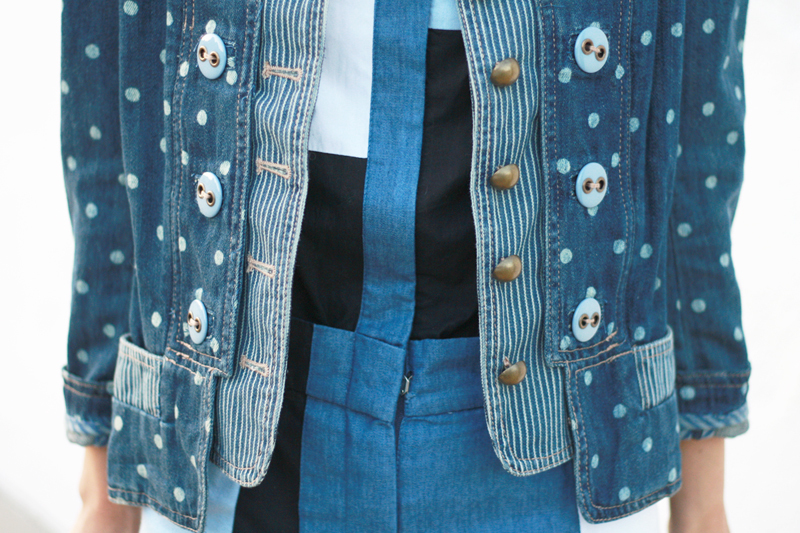 So, I layered it with a polkadot denim jacket by Marc Jacobs I have had for years. It is one of those pieces that I love and cherish but don't wear often because I want to keep it special. Lastly, I wore these awesome leather and mesh booties which have an illusional t-strap design due to the way the leather sits on the mesh. I love them! I am quite pleased with how I managed to mix patterns and shades in this monochromatic look. Oh, and is it just me or do I look like a modern day Betty Rubble from The Flintstones in this outfit? Hahaha. Contrast denim-block dress c/o Choies. Polkadot denim jacket by Marc Jacobs. Leather and mesh booties c/o Choies. I am in LOVE with this look!My favorite is the shoes and the contrast block dress! You look amazing! Amazing styling! Love your jacket and shoes! All the shades of denim really work in this outfit! I love your dotted jacket the best though! Those booties are awesome too.